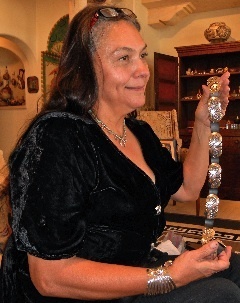 Debbie Silversmith is a Navajo jeweler working today to make quite sophisticated silver jewelry. 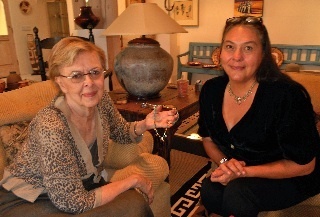 As the granddaughter of legendary Navajo silversmith Kenneth Begay, Debbie Silversmith has had large shoes to fill. Debbie has filled those shoes beautifully by creating her own special adaptations of her grandfather’s impeccable designs. Debbie Silversmith was born on the Navajo reservation in 1957. As a young girl and the eldest grandchild, Debbie had the opportunity to spend a good deal of time with Kenneth Begay, getting to know him and learning the art of jewelry making. By the age of 12, Debbie Silversmith had learned to make her own silver beads entirely by hand. Debbie remembers that her grandfather stressed technical perfection and the use of clean lines all the while teaching her old techniques like tufa casting. Especially influenced by Kenneth Begay’s famous swirls, which represent “water and life,” Debbie loves to recreate her own swirl motif jewelry. When Kenneth Begay passed away in 1977, Debbie Silversmith received his treasured tools, which she still uses today. Since Debbie’s early instruction has remained with her, she proudly creates all of her jewelry by hand. Living on her grandfather’s old property in Steamboat, Arizona , she digs tufa for her tufa cast jewelry from her own backyard, and Debbie Silversmith’s silver beads are still painstakingly soldered and sanded entirely by hand. A newer addition is Debbie Silversmith's fine gold jewelry. Debbie Silversmith is blessed to have come from a family gifted with such a remarkable sense of design, and she’s been able to use that inherited design sense to create her own dazzling jewelry. I am blessed to know her. Click here in order to view a video of Debbie Silversmith briefly discussing her jewelry.